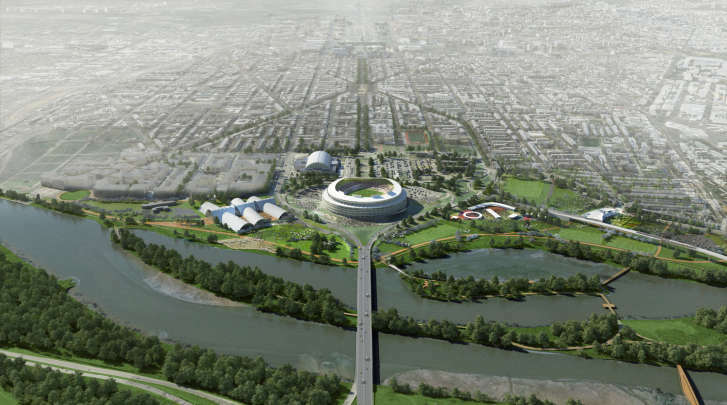 City leaders presented a five-component, short-term plan for the RFK Stadium site at a community meeting Thursday night. WASHINGTON — When it was first announced that the RFK Stadium site was going to be redeveloped, there was considerable consternation from the Capitol Hill, Hill East and Kingman Park communities next to the crumbling structure. Would city leaders do more than just pay lip service to the input they solicited? Would the new plans serve the actual needs of the community? The first piece of that answer came Thursday night at the Walter E. Washington Convention Center, where Events DC unveiled a five-piece plan of short-term programming for the 190-acre site around the stadium itself to about 400 interested citizens. The nearly $500 million plan includes playing fields, a market hall, a massive sports and recreation complex, three pedestrian bridges to better connect the site to the nearby islands and the east side of the river, and a living memorial of Robert F. Kennedy. Many of these components include suggestions collected from the community since the meetings began last April. The plan would increase green space by 240 percent by replacing a number of the mostly unused parking areas. Former mayor and current Ward 7 Councilmember Vincent Gray spoke at the meeting, as did Maeve Fahey Townsend, a Capitol Hill resident, granddaughter of Robert F. Kennedy and daughter of former Maryland Lt. Gov. Kathleen Kennedy Townsend. Events DC reached out to Townsend for input on the memorial portion of the plans. All of the short-term programming components are still dependent on local and federal approvals on the land, which may require some environmental remediation before construction begins. But none are dependent on the eventual fate of the site of the current stadium, and are designed to accommodate three different scenarios: one that includes an NFL team, one that includes a 20,000-seat arena, and one with no anchor tenant. “We want to initiate all of that in the next two years, and obviously some hopefully will be done in five, and some may take longer than five,” said Events DC President and CEO Greg O’Dell, who declined to speculate about the NFL or any other long-term tenant. “We’re going to focus on the short-term and, frankly, [in] the long term we’ll engage the city leadership when appropriate,” he said. The estimated $489.6 million cost for the five components does not include any potential environmental work. Nearly half would be paid for by Events DC ($239.9 million); an anticipated $166.5 million would come from private donors, mostly toward the RFK memorial, while another $83.2 million in public money would go to roads and infrastructure. The project would create an estimated 1,380 construction jobs and 540 permanent jobs, with an annual tax revenue of $4.5 million once all aspects are completed. The three proposed playing fields — two full-sized soccer/lacrosse fields with an additional youth soccer field that includes baseball diamonds and a 2,900 square-foot support building — would be the first element completed, with a projected date of fall 2018. They would run along the eastern edge of the site, close to the river. The proposed market hall would border Kingman Park and offer 61,600 square feet of concessions, prepared food and groceries, with a projected completion date by the end of 2020. Easily the most expensive and expansive of the components is the 350,000 square-foot sports and recreation complex, which would occupy the space that is now Lot 8, the parking lot between D.C. General and the river. Plans include spaces for everything from indoor basketball courts to hockey rinks, bowling lanes, a go-kart track and even bowling lanes, along with an extensive fitness center. The three bridges would connect the River Terrace area to Kingman Island, as well as the bottom of both Kingman and Heritage Islands to the RFK site. All would be both pedestrian- and bike-friendly, in order to encourage the free flow of traffic around the area. The memorial is still in the conceptual stage, with a number of proposed locations and styles. Both the bridges and memorial have target dates at the end of 2021. After presenting the concepts Thursday night, O’Dell was thrilled with the latest response from the community. Allen was optimistic, but preferred to let his constituents weigh in for themselves. However, he stressed the need to continue to push to get things moving.